A classical European style house with a garden in the foreground. bl.uk > Online Gallery Home	> Online exhibitions	> Asia, Pacific and Africa Collections	> A classical European style house with a garden in the foreground. 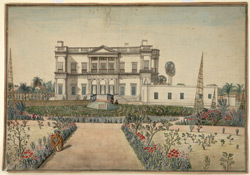 Watercolour with pen and ink of a classical European-style house, by an anonymous artist working in the Patna/Chapra style, c. 1796. This drawing shows two gardeners at work and a sepoy with a sundial hat is seen seated by the gate. A large expansive garden is in the foreground. The Patna style of painting is a subsection of company painting; a style of miniature painting that developed in the second half of the 18th century in response to the tastes and influences of the British serving with the East India Company. The style first emerged in Murshidabad in West Bengal and subsequently spread to other British centres, the most notable being Patna, Benares (Varanasi), Delhi and Lucknow.